Safe Passage Counselor wins Unsung Hero Award! 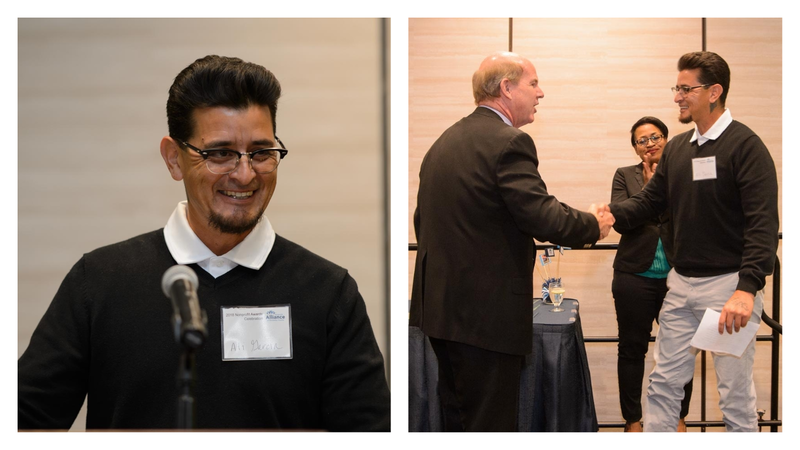 On Friday, September 14th, Ali Garcia, Safe Passage program counselor, was recognized by the Nonprofit Alliance of Monterey County (NAMC) for his work with transitional age youth. Ali received one of three “Unsung Hero” awards, his for innovation. Ali was instrumental in building a relationship with local businesses including McDonald’s to help homeless youth find jobs. To date, more than a dozen youth at Safe Passage have become employees at McDonalds and some have also received tuition assistance for college. Several youth have since transitioned out of Safe Passage, secured housing, are maintaining employment, and are thriving in the community as independent adults. Ali has also forged partnerships with the Portola Hotel, Monterey Peninsula College, CSUMB and Hartnell College to create employment opportunities for homeless youth. Ali has played a vital role in creating a positive economic impact essential to nonprofits like Community Human Services to carry out their mission and has been an advocate for at-risk and homeless youth to have equitable access to employment and equal opportunity to all the community resources Monterey County has to offer.